Hi, I’m Rachel! I am a registered nurse, wife, triathlete, and occasional long distance runner. I never thought I’d end up loving the sport of triathlon, but I was hooked after my first race and haven’t looked back since! I swam summer league back in 4th and 5th grade (semi-proud winner of the “Most Relaxed Swimmer” award), and switched to soccer shortly after that. 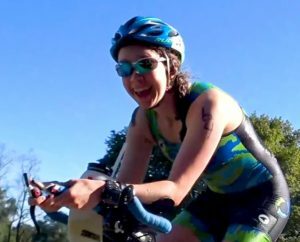 I’ve always loved running, but once I finished my first triathlon in June 2013, I fell in love with the triathlon community…so I bought a road bike, and joined my university’s club triathlon team. Since then, I have finished 35 triathlons/multisport races, 16 of which were with Kinetic Multisports. In addition to fueling a healthy lifestyle, I ended up meeting my husband through our university tri team, so triathlon has definitely been a positive addition to my life! Everyone has been a newbie at some point, which is why our Ambassador team is here to help!